As I said in this month's Update, I was never an active watcher, and the point at which I started - Dino Thunder - was effectively The Force Awakens to A New Hope. Familiar with its concepts but presenting them in a new approach. From an evil Ranger who turns good, the comic relief trying to expose the Ranger's identities in numerous ways, and most importantly of all - Tommy Oliver returning as a core member of a team. 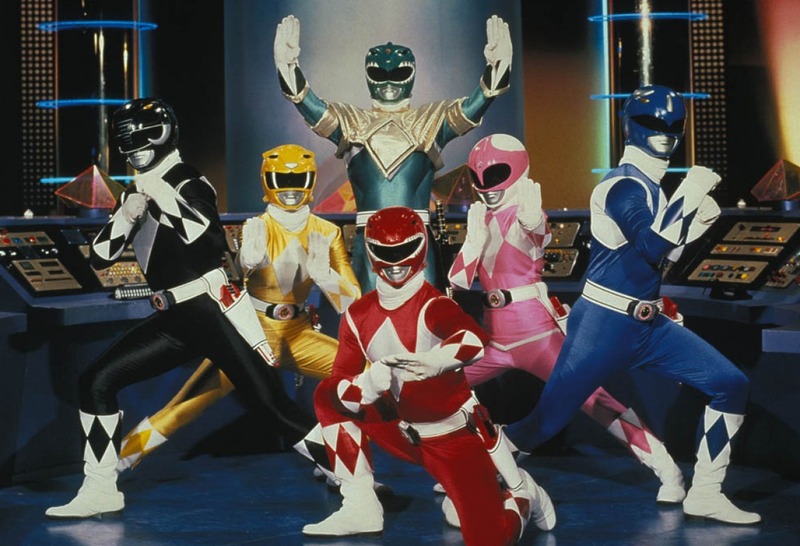 So from someone who's first experience into Power Rangers was from Dino Thunder, what kind of opinion would that one get watching the original? I can say it certainly is a positive one. The core five introduced to us are an interesting bunch, and carry the episodes well. Jason - the martial artist, Billy - the computer geek, Trini - all-round good girl, Zack - dancer and romantic, and Kimberly - athletic gymnast. From the first episode - Day of the Dumpster - it is clear that each possess different qualities and that each helps the others in their own way. Throughout the first few episodes, I found myself enjoying what each had to offer to the episodes. Even Bulk and Skull had entertaining scenes, and bounced off the main five well. Rita Repulsa and Goldar make for good commanders of the villains. Then we get to our sixth main - Tommy Oliver. His introduction rolls off good, with him acting kind and thoughtful, then rude once he gets turned evil. Five episodes to tell this entire story was about right, though I feel it might have done better with just four. The arc occasionally felt stretched, though I do give credit for pacing it mostly right and giving the sense of defeat and despair that lingers through most of the arc. I also have to say this, though I can understand why they did so. Once Tommy is a part of the team, it feels that the writers needed him to be out of the action so created numerous ways of doing so - some of which not working as well as others. It comes down to using the Super Sentai footage for all morphed fight scenes, which is restricting in most cases. I seriously wouldn't want that to change though, as it works for the required purpose. Over the course of numerous episodes, the stakes get raised, and once we reach The Green Candle it is clear we are nearing the end. Or we would, if the proposed ending had indeed happened. The seriousness mixed with light-heartedness is back as Tommy begins to lose his powers. In a highlight of season one, we see Tommy battle Goldar without his powers, then Jason in the second part. It certainly showed their dedication to the team and stopping evil. In a moment that had certainly been built up to, Tommy and Kimberly share a kiss in the final moments of the episode. With Tommy no longer a Ranger, he disappears. It's a small thing, but while the world building is certainly there, the disappearance of characters when no longer needed is jarring. It's also not dealt with very well, as season two demonstrates [though understandable why it happened]. As the proposed end comes to a close, I'm left wondering how the series deals with continuing. And Doomsday does feel like an ending. High stakes, what with the population being sent to the Dark Dimension and Rita's palace landing on Earth. The battles taking place feel like an ending, and then we get what feels like an ending when Rita retreats and the population is returned. The whole Power Ranger day also feels like an ending. It doesn't end the season though, and instead we get more episodes. It's a plus, but considering how many episodes Mighty Morphin' eventually becomes, the episode count of each season could have been reordered later down the line. Once Doomsday is over, numerous episodes play out as they did before the supposed finale. There's a light-hearted feel to all of them that works well with the episodes. Only when we get to Return of an Old Friend do the stakes get raised again. And Tommy is the one who returns. With temporary Green Ranger powers, and the Zyu2 footage, Tommy is able to be a part of the main team, rather than backup. This part of season one also started the lyrical background songs being played during fights. It did work for the most part, as the songs were good to listen to, but they also would sometimes have me zoning out of the action. The end of season one and beginning of season two merge almost seamlessly, with An Oyster Stew providing yet another failure of Rita's before Lord Zedd arrives to take charge. The arrival of Zedd brings a bit more menace to the villain side despite, as we see throughout the season, the ease of which the new Putty Patrollers are dispatched. As the episode Mutiny shows, they are not exactly the best foot soldiers to have. With the Rangers taking care of them in sight of Bulk and Skull, the two comic relief characters now have a new goal. Exposing who the Rangers really are. As the three-part arc continues, more powerful zords are created to tackle the stronger monsters Zedd creates, and so the Thunderzords are in on the action. With the Thunderzords being part of a new season of Super Sentai, there is no sixth zord, so Tommy misses out. Also being a new season of Sentai, yet Rangers still using Zyu2 footage, meant a mixing of footage for all zord fights. As such, throughout the first half of the season, I felt the zord fights were the weakest parts of all episodes. What also didn't help was the extended zord calling and fusion to the Megazord footage being used in all episodes, even after the mixing of footage stopped. Zedd learns how hard it is for the Rangers to be defeated, and season two works its way to being a mix of better and worse. Zedd's plans are the same as what we saw with Rita, and are still as strong in character and fight scenes. Then the zord fight proceeds to just be tiresome. Green No More livens things up by finally erasing the Green Ranger power. Despair is back as it looks like all Rangers lose their powers for good, and Angel Grove is getting taken over by evil. Tommy proves to be the best yet again as he doesn't fall for Goldar's taunting that he is weak, and battles yet again without his powers. With his powers now gone, Tommy makes one last stand and enters the otherworld, destroying the crystal holding the Ranger powers. Now at full strength, the Rangers conquer evil and win yet again. For the next few episodes, we get focus on characters feeling bad about Tommy's departure, with the next episode trying to repeat what caused Tommy's downfall with the other Rangers. We don't have long for Tommy's return, as there are only three episodes between Green No More and White Light. With Part 1 of White Light, Zordon and Alpha shut the command centre down to start on a secret project - without alerting the Rangers they'll be on their own for a while. When they do get called back in Part 2, they have already suffered a defeat. In a reveal that probably surprised no-one when the episode first aired, Tommy is the new White Ranger. Kimberly sure got a shock from it though, passing out as the helmet was being lifted. With Tommy now the leader of the team, the Rangers win the day again. It's at this point that things get a bit low paced. With the episode Opposites Attract, it is the last time the actors who play Jason, Trini, and Zack are on set. Contract disputes led the actors to leave due to being underpaid, and Trini's actress had already suffered an injury on set which the pay barely covered for. As such, over-dubs, archive footage, and stand-ins are the order of the day for the next eight episodes for these characters. Which is odd considering they have actors lined up ready to take their place who feature in all unmorphed scenes and are already in their respective colours for when they become Rangers. As it stands, after a Halloween themed episode, The Ninja Encounter introduces us to Rocky, Adam, and Aisha in an entertaining scene involving a baby stroller. The three newcomers are then shown in a tournament, beating the reigning champions. Introductions between old and new faces happen after, and Lord Zedd captures the newcomers and their teacher. With the Rangers rescuing the newcomers, Billy gets into a spot of trouble after fighting the snake that was about to attack the newcomers. As such, the newcomers learn the identities of the three Rangers, and they are introduced to the command centre and the Rangers' mission. Now, this is a three part arc, and it could have blended so perfectly with The Power Transfer arc in a four parter with nothing in between. Instead there are two episodes between the two arcs, with The Power Transfer being a two parter in which - in my opinion - didn't do a whole lot and seemed mostly to just borrow from The Ninja Encounter. In both arcs, the city is in peril. Both arcs have the newcomers captured. From my perspective, it would have made things quicker paced had those two arcs been merged together in a four - or even three - part arc and also dealt with the actor changes a lot faster. Not to go on with this too much more, but it seemed the three actors who left had been talking about leaving for a while, so why didn't the crew have the transfer while they were still there? They wanted to change the zords and villains to make things seem fresh, so why not add new faces as well? It would also have allowed the old rangers to meet and accept their replacements, as Kimberly does for Katherine in season three. Either way, Jason, Zack, and Trini head off to the conference they were selected for, leaving the new trio with their powers. The battles continue, and Bulk and Skull get time to shine in When Is a Ranger Not a Ranger, as the Rangers get memory wiped by a monster. Now with the knowledge of who the Rangers are, the two make a sacrifice and complete what half of the Rangers were attempting to do to reverse the memory wipe. They lose the knowledge of who the Rangers are, but are the reason the Rangers were able to defeat the monster and save the day. We get quite a few arcs after a few standalone episodes, the first of which being Rangers Back in Time. I'm not getting into all of them, but this one was certainly a fun episode. Reversed in age ten years, the Rangers are now children but have no knowledge of being Rangers. As kids, they get into a fight with some Putty Patrollers, and it's entertaining to see how they still manage to work as a team. Even a young Bulk and Skull get involved in the action. The Wedding is perhaps a weaker three part arc. Rita returns while Lord Zedd is recharging himself. She plans to use Alpha to lure the Rangers into a trap while setting up a marriage with Lord Zedd, implanting a love potion into his recharge chamber. The whole concept felt flat, with the Rangers being in Australia for a conference [yeah, the reason the other Rangers couldn't stay on, even if that one was for an extended time] being called back by a controlled Alpha and sent to a sealed building. The Rangers being trapped inside the building was about the only real good thing from this arc. The arc ends with the Rangers escaping, Rita and Zedd married, and Alpha returned to normal. Not to get too sceptical, but just two parts for the arc would have done just as good, since the only real reason for it to exist anyway was the pairing of Zedd and Rita. It was Zedd who banished Rita in the first place, so for her to return and place a spell on him to forget that would have been good enough. The wedding would have taken place as normal. Having the Rangers out of town, Alpha being controlled, could have been left out for a tighter, better paced arc. Return of the Green Ranger is another battle with the Green Ranger, though this time it is only a copy and not the real Tommy. The other Rangers have been sent back to the 18th century, and stop a plot of evil without powers. Tommy is able to overcome the wizard controlling the clone, as well as go back in time to the other Rangers and save them. Again - two parter would have been fine. As well as that though, it feels like a been here, done that scenario. It's fine to repeat plot points with new characters, though it feels like the third time Tommy has been battling himself in one way or another in this series. An entertaining episode that pits Tommy and Kimberly against each other due to a Rita spell follows this, before two more arcs. A storybook arc places three of the Rangers inside a book, which the other Rangers need to find out how to overcome and free the others. It's certainly a good arc, and runs well with its pacing. Wild West Rangers is also an interesting arc in which Kimberly is sent back in time to Wild West Angel Grove, hiring the help of her teammates ancestors to form the Wild West Rangers to defeat Goldar. This was certainly an interesting set up, allowing most of the actors to take on Wild West personas of their characters, and it worked. Sure, between this and Return of the Green Ranger there are some errors in how time travel affects the world [notable the morphing situation] but considering the rules set out in this arc carry on throughout the franchise, I'll accept how Wild West Rangers presents that situation. After singular episode Blue Ranger Gone Bad, we get to A Friend In Need - the beginning of season three - which sets up the short-lived Masked Rider series. The arc places all Rangers but Kimberly on Alpha's home planet of Edenoi, meeting with the Masked Rider and finding out what happened on the planet. On Earth, Kimberly is sick and so is resting. Until she is called into action. Two points of action on two planets makes for an interesting arc and an entertaining third part with a flu-ridden Kimberly fighting a monster and passing her germs to it. This arc marks the last of a few things. For one, Bulk and Skull are no longer on a quest to expose the Rangers' identities. The Putty Patrollers will no longer be used, being replaced for the Tenga Warriors. And while not exactly this episode, the Thunderzords will be wiped out in the next arc. Speaking of that next arc, Ninja Quest gives the Rangers a completely new set of powers, a new ally in Ninjor, but also sets a new villain onto them in the form of Rito Repulso - Rita's brother. With the first part completely wrecking the Ranger powers and zords, part two sets them on the quest. Bulk and Skull are also on a quest - to join the police force to attract female attention. Part three gives the Rangers their new powers, while also restoring their old suits, and put Bulk and Skull in the hands of their new boss - Lieutenant Jerome Stone. Part four gives the first real test of the new Ranger powers, and Bulk and Skull make the grade to be trained as officers. I'm not going to be that harsh here. The four parts did well in communicating what they had to, with each having its own intent. As such, the arc felt reasonably well paced. With several episodes between that four part arc and the next arc [only two parts], a bit of foreshadowing takes place with Kimberly having a bad dream about moving to Paris. Arriving at Stop the Hate Master, it's another spell placed on the Rangers to make them fall out. Aisha is the only one unaffected by this, and has to work out how to break the spell. It's an interesting stop-gap arc before more serious stuff starts happening, though of course with the Rangers all set to be leaving, this arc is serious in its own right. A Ranger Catastrophe takes the good turned evil plot and applies it to the Pink Ranger. New girl Katherine is in town and befriends Kimberly. The plan is simple. Kat is in the hands of Rita, and the power coin of Kimberly must be taken. Already though, the spell of Rita is breaking. It's quite a bit of character development for both Kim and Kat throughout the arc, and it's here that Kimberly's real arc starts. Katherine is still under the spell for Changing of the Zords, a three part arc that didn't really do all that much for me. Rita and co. plan to acquire the ancient zords, and with Kat stealing Kim's power coin yet again, the power struggle for those zords begins. At the end of the arc, the Rangers are in control of them with Kim's power coin returned. After another entertaining episode where Kimberly is trapped inside a vehicle with Bulk and Skull, we get to the point of Kimberly leaving. A Different Shade of Pink has Kimberly in training for a gymnastics competition, and now would be a bad time for her to be distracted. This is her chance to become a professional gymnast, but she can't do double duty. Missing out on a training session due to fighting with the team, Kimberly is up all night practising her gym moves, getting tired all the time. Katherine's friendship with Kim makes her break the spell of Rita, and rushes in to see Kim faint. In the hospital, Kat comes clean with the other Rangers, and Kim makes her decision. In the Power Chamber, the passing of power is a simple power coin exchange, and Katherine is the new Pink Ranger. Alien Rangers... I really tried to like you. I really did. The mini-series is set up with Rangers in Reverse, the last episode of season three. Fact is though, the first half of Alien Rangers just felt like a second run of Rangers Back In Time, with the second half effectively being the start of Zeo. 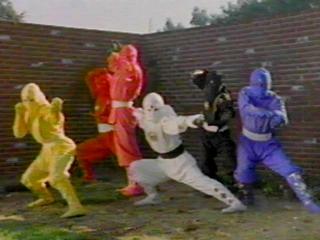 The start introduces the Alien Rangers of Aquitar. Since the world has again gone back in time, Zordon contacts Aquitar to acquire some assistance in defending Earth. Throughout the two parter, the kid Rangers once again defend themselves, though this time their memories of being Rangers are intact. A bomb is placed at the command centre, which gets difused by Alpha. And Master Vile reaches breaking point after just three defeats, retreating back home. So much for even introducing him then. The next episode has Billy create a device to return the Rangers to normal age. It serves as a way to destroy the power coins once and for all, as once Billy is restored the device is captured and destroyed by the villains. Only when the kid Rangers go on their quests to retrieve pieces of the Zeo Crystal do things get interesting. Each of the Rangers have a finding themselves moment, which will make for an arc for Tommy in Zeo. The final arc of Mighty Morphin' as a whole is Hogday Afternoon. With Lord Zedd bringing the Alien Rangers' nemesis - Hydro Hog - to Earth, a battle that could leave Earth defenceless takes place. Aisha is the one left to retrieve her piece of Crystal, and once she does, she makes a request that an orphan named Tanya brings it back in her place. With the Zeo Crystal reformed, Earth is returned to normal, the Rangers are back to their normal ages, and after sending the Alien Rangers back home, yet another bomb is set off in the command centre as Rito and Goldar steal the Zeo Crystal. The Rangers are teleported outside, and the series ends. Okay, I admit. 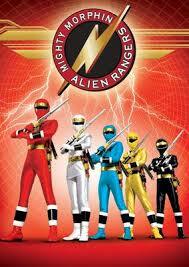 I liked the premise of the Alien Rangers themselves. It gave us a look at aliens surviving outside of their natural environment, and allowed some good scenes of learning new things from new people. It just felt too slow as an arc. It also felt like the battles during the quests were inserted as they couldn't carry an episode on their own. Adam and Rocky could have been condensed to one episode just the same as Tommy and Kat. This look at the series has gone on massively long, but with a running total of 155 episodes, it is to be expected. Thankfully no other series of Power Rangers goes on for that amount of time - even two together - so from now on these should be reduced in size. As for how I view this series as a whole, it's certainly enjoyable at first. That enjoyment stays throughout the series, but despite swapping characters, suits, villains, zords, and changing up the weaponry used, there are many points later in the series that suffer from a been here, done that feel. As for referring back to what I said at the beginning, watching this series has certainly made me appreciate Dino Thunder all the more, and I can respect this series for starting the legacy of the Rangers. Next up in this series is looking at both Zeo and Turbo. That's all for now, so bye for now.